This has been a personal dream of mine and now Viki has done it. I always wanted to do some sort of flatland video section at the Pyramids in Egypt. After checking out this edit, I asked Viki some questions about his adventure to the Pyramids. Viki Gomez BMX Flatland champion riding in fron of the Pyramids in Egypt!!! from PSYCHOSTUDIO on Vimeo. FM: Why did you decide to go to Egypt? Viki: I was invited to do a promotional tour with Red Bull in Egypt. I have a lot of good conexions world wide and I have my team mate called "Miguel Monzon" (Guelo) who is an amazing show rider! We perform and promote in unbelievable places and everyone knows that we are friendly, social and party hardy! hehe Red Bull attitude! FM: Did you always have the plan to ride in front of the Pyramids? Viki: I never thought about it and when we were there I didnt think it was possible until I saw the spot! 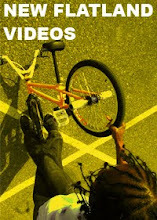 It was not a perfect spot and it was so hard to pull tricks thats why the video has some of my easy combos. Viki: Guelo was with me! He filmed me! But also Red Bull had its own camera man who film and took nice photos! FM: Did you have any problems with security? Viki: Not at all! We just hide the bikes inside the Red Bull truck and we remove them from the truck to film in the spot. It was a memorable day! FM: In the USA we get a lot of media that might say that it's dangerous. Looks like you were having fun out there. How was Egypt? Viki: The media nowadays just want to scare the masses so they keep being masses and then they don't progress. Its 100% safe to go there. Everyone knows that the problem was solved in March already and now they have democracy, it's safe and the egyptians treat the foreigners the best! first of all because they are very nice and friendly people and second because the tourism is one of the biggest income for the country! So go to Egypt, have fun, learn some culture, go party and maybe if you are lucky you will find your love there!